It was a beautiful day today, with lots of bluebells to sniff and where we stumbled upon a large slow worm which, fortunately, Theo wasn’t interested in. He was intent on the field of cows down the hill. We’ve been practising our tricks, walking backwards, walking around in a circle and my favourite new one – catching a kibble. So, we’re all set for a good long bank holiday. And to quote from the movie “The Long Good Friday”, what Theo is looking for is “a bit more than a hotdog”. Take care, give care, and stay ginger. 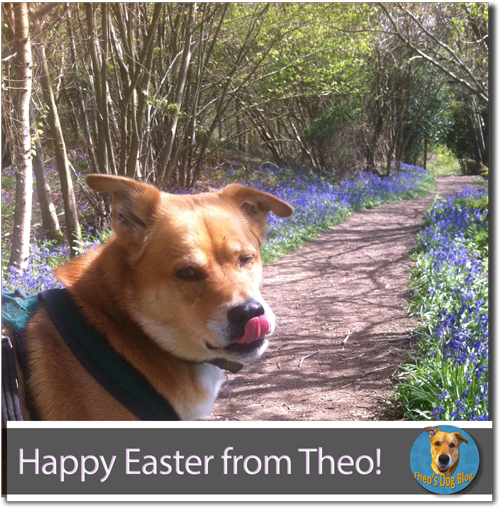 Theo’s Dog Blog signing off!